Sweet Dairy Whey adds creaminess and a very slight sweetness to the yoghurt without adding significant calories. You can buy it online. 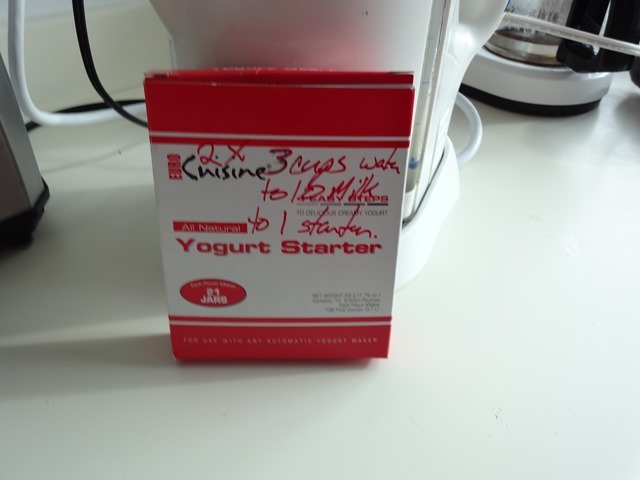 We purchased yoghurt starter as part of our initial experiments to give us a standard to test our experiments. It turns out that you don’t really need it unless you can’t get plain fresh yoghurt easily. 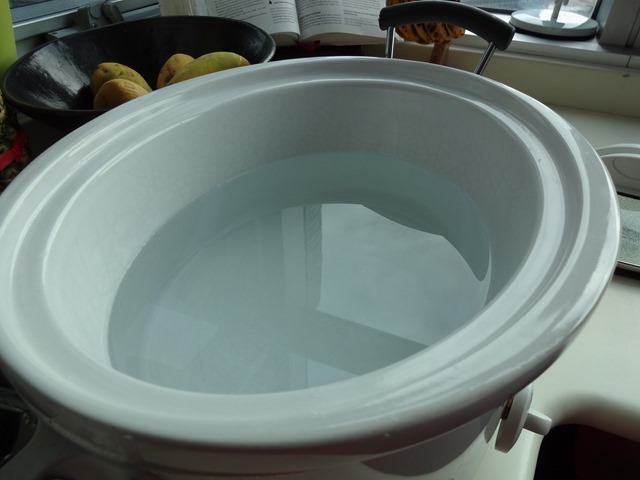 2 large plastic jugs or bowls for mixing. 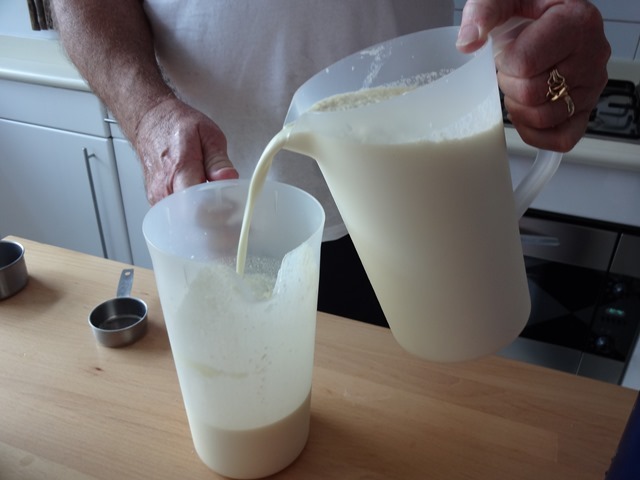 Pour milk(or water) into plastic jugs. 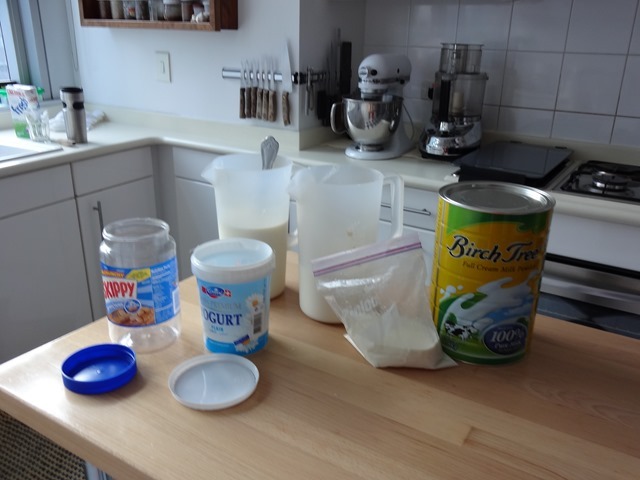 Add 2/3 cup of milk powder to each jug and whisk. 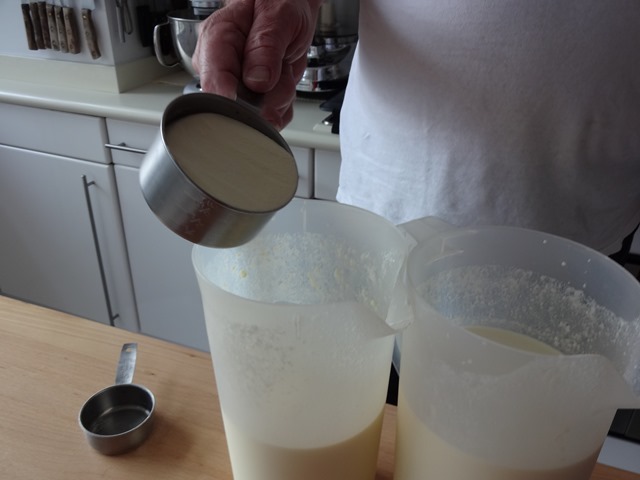 Add half the yoghurt starter to each jug. Mix well. 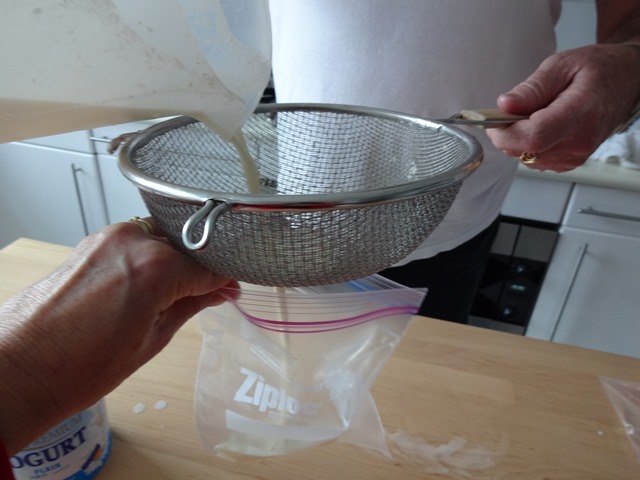 Finally add the sweet dairy whey to each container and whisk well.We like to use two jugs and pour the liquid back and forth to make sure both jugs have equally combined ingredients. Pour the mixture through a sieve because at the bottom there are usually lumps of powder that did not mix in well enough. 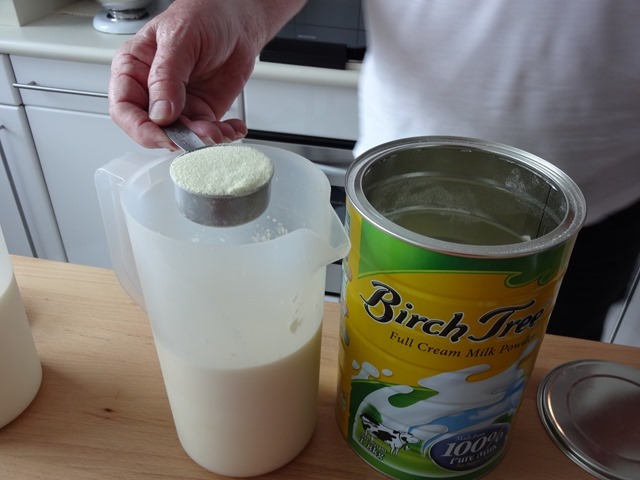 You can pour the mixture directly into the yoghurt containers. Because of all the powder you have added the volume will have increased to greater than 2 litres. So pour the extra mixture into a small baggie or tupperware container. This will be processed along with the main yoghurt containers but will become your yoghurt starter for your next batch. Once its made, you can just leave it to cool down and put it in the freezer, ready for your next batch of yoghurt another time. 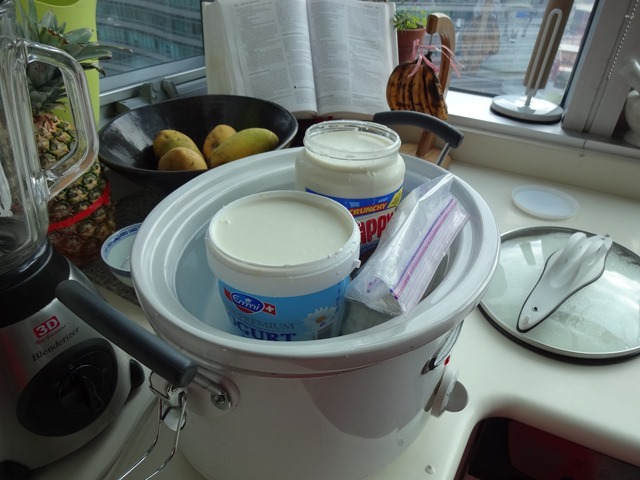 Put the yoghurt containers and baggie into the crockpot. 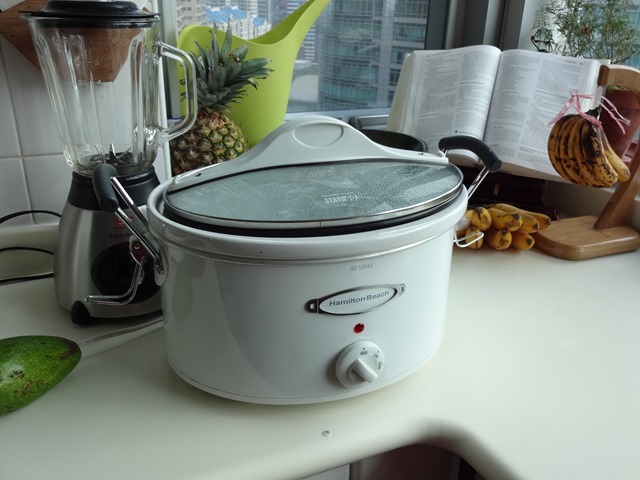 The crockpot should be no more than 1/3 full of warm water. Note our containers are too tall to fit into the crockpot to close the lid properly. 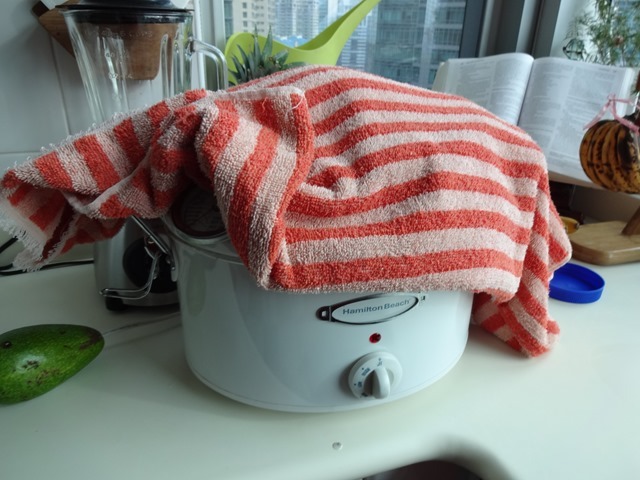 This is not a problem if you use a thermometer to keep track of the temperate and a towel to cover the top of the crockpot and act as a blanket. You should try to maintain a temperature of 100 degrees Fahrenheit. The minimum mark on our meat thermometer is 120 degrees, so once we see the temperature is getting near the 120 mark, we turn the crockpot off and let it sit for a couple of hours, keeping an eye on the thermometer and turning the crockpot back on again to bring the temperature up again. 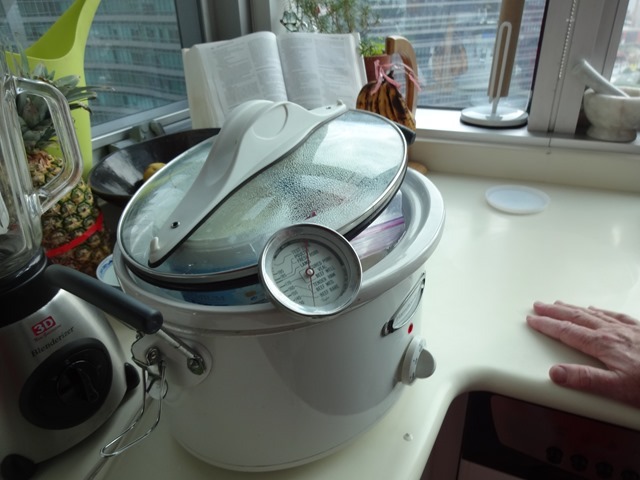 This can be much easier if you have a hot area in the house that you know maintains a high temperature, or a crockpot that can maintain 100 degrees by itself. Ours can’t and we are fighting erratic airconditioning in the kitchen. With a little practice your get a feel for how long it takes and how many times you need to check the temperature. Yoghurt making takes 4-8 hrs typically. In the right temperature conditions, you can put it on before you go to bed and wake up to fresh yoghurt. 1. Always wash up the mixing equipment immediately. The milk and whey powder traces turn to concrete on the sides of the jugs. 2. 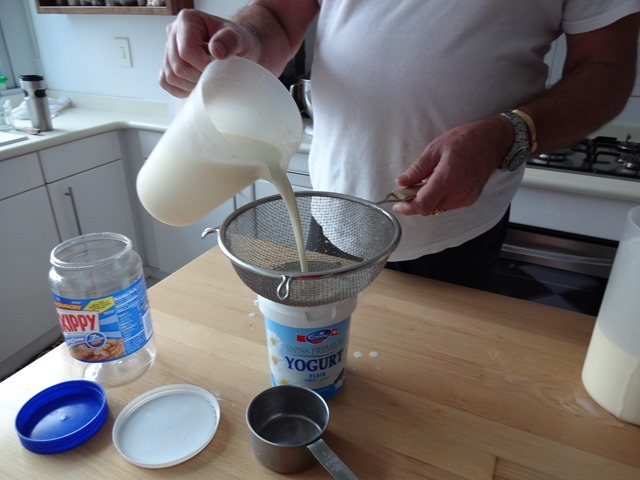 If you don’t want to purchase yoghurt starter and have yet to make your own baggie, you can use commercial yoghurt. Most of them will say “live yoghurt” on the side of the container which indicates that it has the live culture to make your own. The exception would be highly processed yoghurts, especially those that don’t need refrigeration. 3. If the yoghurt didn’t set, the temperature was too low. If the yoghurt curdles the temperature was too high. Try again with adjusted temperature controls. 4. Don’t expect to get it right the first time, but its also not that difficult. Once you figure out how to control the temperature, the battle is won. The flavour, texture and quality is vastly superior to commercial yoghurt. Its worth figuring this out just for the improved product. However the cost is also significantly cheaper. Made with only water and skimmed milk powder, the cost is about $1.50/kilo. 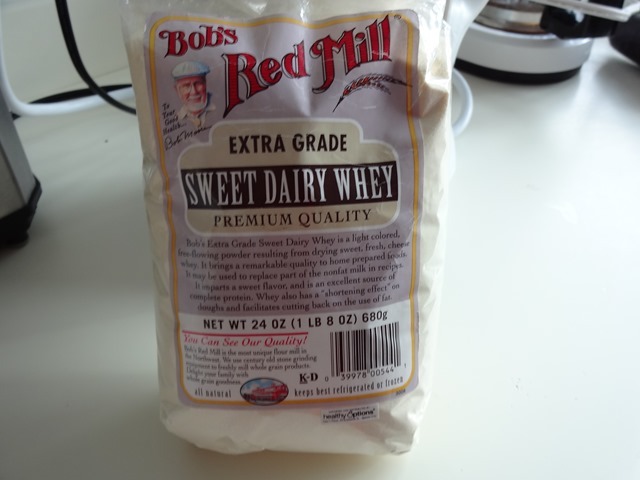 Using UHT milk and dairy whey, the cost goes up to $3.00/kilo. Compared to the prices that we are paying here for imported yoghurt, that’s a steal. Imported yoghurt costs from $11-20/kilo here.